Bacterial biofilms are found in various environmental niches and are mostly comprised by two or more bacterial species. One such example, are the mixed species bacterial biofilms found in chronic lung infections of cystic fibrosis (CF) patients, which include the Staphylococcus aureus and Pseudomonas aeruginosa bacterial species. S. aureus is one of the CF lung initial colonizers and is assumed to be abrogated when P. aeruginosa becomes established, eliminating its involvement as the infection evolves. Common models used in research do not mimic the actual progression of the mixed species biofilms thus, in this work we developed an in vitro model, where S. aureus biofilms establish prior to the introduction of P. aeruginosa, simulating a state that is phenotypically more similar to the one found in CF lungs. Overall our results demonstrate that S. aureus is not outcompeted, and that timing of inoculation and bacterial concentration affect the final bacterial ratio and quorum sensing related gene expression during the dual species biofilm development. Biofilms, bacterial communities with a distinct phenotype compared to free-living planktonic cells, are considered to be responsible for most chronic infections. The biofilm phenotype has several characteristics including: differential expression of efflux pumps, presence of a self-produced extracellular polymeric matrix (EPS) surrounding the cells, an increased resistance to antimicrobials and the ability to escape the host immune response (Stoodley et al., 2002; Southey-Pillig et al., 2005; Hurley et al., 2012; Bjarnsholt et al., 2013; Kostakioti et al., 2013). Thus, biofilm growth results in an increased resistance to environmental stresses and an ability to persist within harsh environments (Stoodley et al., 2002). When gaging their surrounding environment bacteria make use of cell–cell communication, also known as quorum sensing (QS), a necessary survival skill as biofilm infections are normally composed by several bacterial species, such as the ones found in wound infections, eye infections, and lung infections of cystic fibrosis (CF) patients (Recsei et al., 1986; Lyczak et al., 2002; Burmølle et al., 2006; Bjarnsholt et al., 2010b; Stacy et al., 2016). These signaling systems have been shown to regulate EPS, efflux pumps, attachment, and virulence factors known to be associated with disease and bacterial cohabitation (Bjarnsholt et al., 2010a). Gram-negative bacteria make use of acyl-homoserine lactones, while Gram-positive bacteria use short signaling peptides. In Pseudomonas aeruginosa, las, rhl, and pqs are the main signaling systems (Figure 1; Pearson et al., 1997). In Staphylococcus aureus, the sarA, agrB, and icaR regulate its ability to survive within a biofilm while in the host, and while coexisting with other bacterial species (Figure 1; Le and Otto, 2015). Figure 1. Overview of the Staphylococcus aureus and Pseudomonas aeruginosa quorum sensing (QS) hierarchy (Adapted from Pearson et al., 1997; Le and Otto, 2015). In CF patients the bacteria co-existence within the airways leads to lung pathogenesis during infection (Hibbing et al., 2010; Rogers et al., 2010). S. aureus is one of the initial microbial colonizers of the CF airway followed by other opportunistic organisms such as P. aeruginosa and Burkholderia cepacia (Lyczak et al., 2002; Mashburn et al., 2005; Kahl, 2010). The interaction between S. aureus and P. aeruginosa, when in co-culture, have been described both in vivo and in vitro, where bacteria are inoculated simultaneously and at identical concentrations. Most studies suggest that S. aureus is predominantly outcompeted by P. aeruginosa and thus, has a minimal contribution to the overall course of the infection (Machan et al., 1991; Mashburn et al., 2005; Kahl, 2010; Bragonzi et al., 2012; Filkins et al., 2015). The overall prognosis of a patient is changed once the host’s immune response is activated by the presence of S. aureus and P. aeruginosa, resulting in alteration of mucus production, neutrophil recruitment, and fluctuations in free metabolites (Machan et al., 1991; Høiby et al., 2011; Alavi et al., 2013; Baldan et al., 2014; Chekabab et al., 2015). In certain instances, the presence of S. aureus hampers the host’s immune response to P. aeruginosa by inhibiting IL-8, responsible for the recruitment of neutrophils (Joseph et al., 2005; Chekabab et al., 2015). Other studies suggest that when in the presence of P. aeruginosa, S. aureus sigma factor B is activated, resulting in a phenotypic change to a small colony variant (SCV) with a decreased metabolic rate (Hoffman et al., 2006; Biswas et al., 2009; Mitchell et al., 2010; Filkins et al., 2015). This S. aureus conversion to SCV is commonly associated with an increased resistance to the stress environment found within the lungs of CF patients (Moisan et al., 2006). Common consensus is that S. aureus survival in co-culture with P. aeruginosa is dependent on its ability to convert to the SCV phenotype (Hoffman et al., 2006). Although a significant progress has been made in co-culturing S. aureus and P. aeruginosa, the understanding provided by these studies is limited by inferring that S. aureus is no longer contributing. Thus, despite the increase in research on multi-species biofilms, their interaction and their interspecies communication is still not completely understood (Recsei et al., 1986; Bjarnsholt et al., 2010a; Stacy et al., 2016). Driven by this gap in knowledge together with the new findings that 31% of CF patients are co-infected with P. aeruginosa and S. aureus (Limoli et al., 2016), that older CF patients have higher S. aureus infection rates than previously anticipated (Cystic Fibrosis Foundation, 2016), and that P. aeruginosa co-isolated with S. aureus from CF patients display a lower competitiveness and co-exist with S. aureus in vitro (Limoli et al., 2017). Our study focused on determining whether we can simulate the S. aureus and P. aeruginosa biofilm co-culture found the lung of CF patients. Staphylococcus aureus (ATCC 6538) and P. aeruginosa PAO1 were used throughout this study. Media consisted of full-strength brain heart infusion medium (BHI) and Lennox LB medium (LB), 20% BHI, and 10% BHI. P. aeruginosa quorum sensing mutants used in this study included: P. aeruginosa PAO-JP1 (ΔlasI), P. aeruginosa PAO-JP2 (ΔlasI/rhlI), and P. aeruginosa PDO100 (ΔrhlI) (Pearson et al., 1997; Pesci et al., 1997). Single and dual species biofilms of P. aeruginosa and S. aureus were grown on 2 types of abiotic surfaces: polystyrene wells and silicone tube reactors. Single and dual-species biofilms of P. aeruginosa and S. aureus were grown on 24 well polystyrene plates, at 37°C with shaking (220 rpm) [MaxQTM 4000 Benchrtop Orbital Shaker, Thermo Scientific with a 0.75 (19 mm) circular orbit]. An overnight culture of S. aureus (400 μL) was used to inoculate the reactors at a concentration of 7 × 107 CFU/mL. Following 1 h of bacterial attachment, the non-attached cells were removed by replenishing the medium (20% BHI medium strength). Medium was subsequently replenished every 12 h for the duration of the experiment. S. aureus biofilms developed for a period of 5 days, after which, P. aeruginosa was introduced at a ratio of 1 P. aeruginosa bacterium to 250 S. aureus bacteria. P. aeruginosa was allowed to adhere to the pre-existing biofilms and non-colonized surfaces for a period of 1 h, after which the non-attached cells were removed by replenishing the media. Bacterial load within biofilms was assessed at 24 h intervals throughout the experiments. Sampling was attained by removing the supernatant and replenishing the wells with phosphate buffer saline (PBS), after which, biofilms were scraped from the surface using a pipette tip, and the sample was placed onto a microfuge tube, homogenized with a tissue tearor homogenizer, serially diluted, and drop platted onto mannitol salt agar (Difco), Pseudomonas isolation agar (Difco), and 50% plate count agar (Difco). Cell viability was determined following 24 h of incubation at 37°C. Controls consisted of axenic cultures of S. aureus and P. aeruginosa. Additional experiments were performed where biofilm cultures were co-inoculated with S. aureus and P. aeruginosa at a ratio of 250 to 1. Single and dual-species biofilms of P. aeruginosa and S. aureus were grown in a silicone tube reactor system, at 22°C under continuous flow conditions, as previously described (Sauer et al., 2002; Davies and Marques, 2009; Marques et al., 2014). An overnight culture of S. aureus (1.8 mL) was inoculated at a concentration of 7 × 107 CFU/mL and allowed to attach to the silicone tubing for a period of 1 h under static conditions. The medium (10% BHI) flow was then initiated at (10.8 ml/h) and S. aureus biofilms were allowed to establish for a period of 5 days. On day 5, P. aeruginosa was introduced at a ratio of 1 P. aeruginosa bacterium to 250 S. aureus bacteria and dual species biofilms were cultured for further 14 days. During the introduction of P. aeruginosa the flow was stopped for a period of 1 h to allow for bacterial attachment. Bacterial viability was monitored at 24 h intervals. Biofilm samples were harvested with the role pin method (Sauer et al., 2002) where the biofilm paste was resuspended in 1 mL of phosphate buffer saline (PBS), homogenized for 20 sec with a tissue tearor homogenizer, serially diluted, and drop platted onto mannitol salt agar (Difco), Pseudomonas isolation agar (Difco), and 50% plate count agar (Difco). Cell viability was determined following 24 h of incubation at 37°C. Controls consisted of axenic cultures of S. aureus and P. aeruginosa. Relative gene expression was quantified for both S. aureus and P. aeruginosa biofilms when cultured as single and dual-species. Biofilm samples were collected directly into RNA protect at several time points: 24, 48, 72, 96, and 120 h. RNA was extracted from RNA Protect-treated (Qiagen) samples, using the RNeasy mini kit (Qiagen), with residual DNA degraded using the DNase I amplification grade kit (Invitrogen). A total of 0.5 μg of RNA was used for cDNA synthesis, and cDNA was generated using a RETROscript® Kit (Ambion). Quantitative reverse transcriptase PCR (qRT-PCR) was performed with an Eppendorf Mastercycler ep realplex instrument (Eppendorf AG, Hamburg, Germany) and the KAPA SYBR FAST qPCR Kit (Kapa Biosystems, Woburn, MA, United States) with the oligonucleotides (obtained from Integrated DNA Technologies, Coralville, IA, United States) listed in Table 1. No reverse transcriptase (NRT) reactions and no template control (NTC) were performed to ensure the absence of foreign or genomic DNA contamination during the preparation of samples and master mix. Relative transcript quantitation was accomplished using the ep realplex software (Eppendorf AG) with the transcript abundance (based on the threshold cycle value Ct) of S. aureus normalized to tpiA (control), and P. aeruginosa normalized to mreB (control), before the determination of transcript abundance ratios. Verification of single-product amplification was carried out through the analysis of the melting curves. Inhibition of S. aureus growth by compounds present in the supernatant of P. aeruginosa cultures was evaluated with late stationary phase cultures (24 h) of P. aeruginosa WT, PAO-JP1 (ΔlasI), PAO-JP2 (ΔlasIrhlI), and PDO100 (ΔrhlI). Cultures were grown 37°C with agitation (220 rpm) in BHI medium. Culture biomass was standardized to 108 CFU/mL, after which, 5 mL of each culture were sedimented by centrifugation at 16,000 × g for 10 min at 4°C. The supernatant was removed and filtered through a 0.2 μm syringe filter. Spent medium was stored at -80°C until further use. An overnight culture of S. aureus was standardized to 0.5 McFarland, and a lawn was prepared on Mueller Hinton Agar with an agar concentration of 1.5%. Wells with 0.5 cm diameter were punctured into the agar, agar plugs were removed, discarded, and 150 μL of supernatant were added to each well. Controls consisted of sterile medium processed similarly to bacterial cultures. Cultures were then incubated at 37°C for a period of 24 h. Zones of inhibition were measured at 12 and 24 h.
S. aureus and P. aeruginosa are commonly co-isolated from chronic wounds, catheter infections, eye infections, skin infections, and lung infection in CF patients (Machan et al., 1991; Hoffman et al., 2006; Baldan et al., 2014). However, most previous attempts to establish and study these 2 microorganisms as dual-species biofilms under laboratory conditions has been futile as, S. aureus is mainly outcompeted and eradicated (Baldan et al., 2014; Filkins et al., 2015). Thus, in this work, we approached culturing these dual-species biofilms by attempting to simulate in vivo conditions, where S. aureus biofilms are first established followed by the introduction of P. aeruginosa. To achieve this, P. aeruginosa was inoculated into pre-cultured (5 day old) S. aureus biofilms grown in 20% BHI medium, either at room temperature (RT) or 37°C (Figure 2), at the ratio of 1 P. aeruginosa to 250 S. aureus. Figure 2. Staphylococcus aureus persists in co-culture with P. aeruginosa on abiotic surfaces. S. aureus was allowed to establish a biofilm for 5 days prior to the introduction of P. aeruginosa. P. aeruginosa was introduced at a concentration of 1 P. aeruginosa to 250 S. aureus. Dual-species growth and bacterial maintenance was determined in various growth conditions: (A,B) 20% BHI at 37°C under agitation at 220 rpm, (C,D) 10% BHI at 22°C under continuous flow conditions. Controls consisted of biofilms of axenic cultures. Bacterial viability and strain ratios were evaluated daily. (A) S. aureus viable counts, (B) P. aeruginosa viable counts, (C) S. aureus viable counts, (D) P. aeruginosa viable counts. ∗p < 0.01 comparing to the axenic cultures. Arrow indicates introduction of P. aeruginosa. When cultured at 37°C in 24-well plates (Figures 2A,B and Table 2), 24 h following its introduction, P. aeruginosa made up 50% of the overall bacterial cells within the dual-species biofilms, where a 2-Log reduction of the S. aureus viable cells occurred (Figure 2A). The reduction of S. aureus viable cells continued up to 48 h, where it reached 5 × 103 CFU/cm2 (0.3% of the total population of cells) after which, increased slightly, followed by a bacterial reduction to day 2 levels, by day 5 (Figure 2A). When culturing the biofilms at RT (Figures 2C,D and Table 3) the introduction of P. aeruginosa, led to a minimal reduction of S. aureus viable cells, with the exception of day 10, where a significant decrease of S. aureus occurred, before recovering up to day 14, where a second decrease in S. aureus viability occurred (Figure 2C). These results could indicate that, in both culture conditions, the dual-species reached a co-relationship stability. Table 2. Ratio of Staphylococcus aureus and Pseudomonas aeruginosa when co-cultured in dual-species biofilms on 24-well plates at 37°C with agitation. Table 3. Ratio of S. aureus and P. aeruginosa when co-cultured in dual-species biofilms on tube reactors at 22°C. When in co-culture with S. aureus, the cell viability of P. aeruginosa remained constant from day 1 of co-culture onward (Figures 2B,D). However, the total bacterial composition of the dual species biofilms changed throughout the experiment and the percentage of P. aeruginosa increased overtime. At day 1 of co-culture, P. aeruginosa represented ≤50% of the overall bacterial population, this percentage increased to ≥98% of the total population by day 10 (Tables 2, 3). Comparing to single species growth, the introduction of P. aeruginosa led to a significant decrease of S. aureus when co-cultured in 24 well plates (Figure 2A and Table 2). This decrease was not observed within tube reactors (Figure 2C) for most of the experimental duration. P. aeruginosa cell viability was identical in the presence or the absence of S. aureus, with the exception of the tube reactor cultures where at day 1, the cell viability was significantly higher when co-cultured with S. aureus (Figure 2D and Table 2). Previous research has demonstrated that when co-inoculating S. aureus and P. aeruginosa at a 1:1 ratio, P. aeruginosa completely outcompetes S. aureus (Baldan et al., 2014; Filkins et al., 2015). Upon finding that the introduction of P. aeruginosa into pre-established S. aureus biofilms led to dual-species biofilms that reached a co-relationship equilibrium and not to an eradication of S. aureus (Figure 2), we decided to evaluate whether the out-competition would still occur at the 250:1 ratio of S. aureus:P. aeruginosa. At day 5 of dual-species cultures on abiotic surfaces, when using BHI media at 37°C, we found that S. aureus was not eradicated, as anticipated (Figure 3 and Table 4). At day 0, following 1-h inoculation, cells attached to the wells consisted of 99.99% S. aureus (107 CFU/cm2), and 0.01% P. aeruginosa (103 CFU/cm2). This ratio was inverted by day 2, where the bacterial biomass consisted of 4.5% S. aureus (5 × 105 CFU/cm2) and 95.5% P. aeruginosa (2 × 107 CFU/cm2). Throughout the remainder of the experiment, S. aureus decreased at a steady rate, reaching 102 CFU/cm2 (0.0005%) by day 5 (Figure 3). While in co-culture, the P. aeruginosa cell viability remained constant from day 1 onward, a pattern identical to the one observed for P. aeruginosa axenic cultures. S. aureus axenic cultures also remained constant throughout the experiments (Figure 3). Figure 3. Staphylococcus aureus persists in dual-species biofilms when co-inoculated with P. aeruginosa. Dual-species biofilms were initiated on a polystyrene surface with S. aureus and P. aeruginosa at a concentration of 250:1. Biofilm growth was monitored for a period of 5 days under several conditions: 20% BHI at 37°C under agitation at 220 rpm. Media was replaced at 12 h intervals and bacterial viability and strain ratios were evaluated daily. Controls consisted of biofilms of axenic cultures. Bacterial viability and strain ratios were evaluated daily. ∗p < 0.001 comparing to the axenic culture. Table 4. Ratio of S. aureus and P. aeruginosa when co-cultured in dual-species biofilms on 24-well plates at 37°C with agitation. Thus, under the conditions used in this study, independently of being inoculated simultaneously or staggered, S. aureus is not eradicated when in dual-species biofilms, as long as P. aeruginosa is initially present at a significantly lower concentration than S. aureus. This provided us with means to further study their interactions. As S. aureus was not completely eradicated when in co-culture with P. aeruginosa (Figure 2), we quantified the relative gene expression of QS related genes throughout the 5 days of co-culture. This was performed in experiments when S. aureus was allowed to establish for a period of 5 days previous to the introduction of P. aeruginosa. In P. aeruginosa, all the QS genes chosen were up regulated once introduced into the preexisting S. aureus biofilms, comparing to single species biofilms at identical culture time (Figure 4A). By day 3 rhlI and pqsH were down-regulated and by day 4, all QS genes presented no change or were down regulated compared to single species biofilms (Figure 4A). When comparing to day 1 of dual-species (Figure 4B), P. aeruginosa rhlR and lasR presented no significant relative gene expression change at days 2 and 5, being slightly up-regulated at days 3 and 4. Relative expression of rhlI, lasI, and pqsH was up regulated throughout the experiment (Figure 4B). When quantifying the relative expression of S. aureus QS related genes, agrB was upregulated from day 2 onward, while sarA, sigB, and icaR, were slightly downregulated, when compared to S. aureus growing alone (Figure 5A). When comparing to day 0 of co-culture, agrB was upregulated from day 3, while no significant change was observed for sigB and icaR, and sarA was slightly downregulated (Figure 5B). Figure 4. Pseudomonas aeruginosa QS gene expression when co-cultured with S. aureus on tube reactors. S. aureus biofilms were cultured in tube reactors for a period of 5 days previous to the introduction of P. aeruginosa. Once P. aeruginosa aeruginosa was introduced (day 0), samples were taken at 24 h intervals for a period of 120 h. (A) relative expression of P. aeruginosa compared to single species biofilms, (B) relative expression of P. aeruginosa QS genes in dual-species biofilms compared to day 1 of co-culture. Changes of relative expression were considered significant when a twofold change was present. Figure 5. Staphylococcus aureus QS gene expression when co-cultured with P. aeruginosa on tube reactors. S. aureus biofilms were cultured in tube reactors for a period of 5 days previous to the introduction of P. aeruginosa. Once P. aeruginosa aeruginosa was introduced (day 0), samples were taken at 24 h intervals for a period of 120 h. (A) relative expression of S. aureus QS genes in dual-species biofilms compared to single species biofilms. (B) Relative expression of S. aureus single species biofilms compared to time 0. Changes of relative expression were considered significant when a twofold change was present. Considering the up-regulation of the relative expression of the rhl and las genes during the first 2 days (Figure 4), we then evaluated the effect of their absence on S. aureus growth. We found that the supernatant of ΔlasI and ΔrhlI inhibited S. aureus growth albeit at a lower rate than WT (Figure 6). ΔlasIrhlI did not inhibit S. aureus growth. Furthermore, co-cultures of P. aeruginosa WT and S. aureus led to a 4 Log reduction of the latter by day 2, with a slight cell recovery by day 4, which decrease again to a 4 Log reduction by day 5. 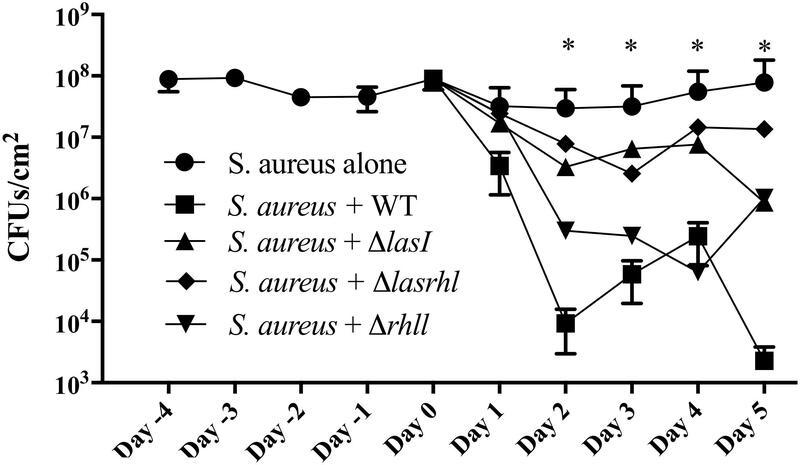 In contrast, mutation of QS related genes in P. aeruginosa led to a less effective removal of S. aureus (Figure 7). Inactivation of lasI as well as both lasI and rhlI genes (ΔlasIrhlI) led to a 1 Log reduction of S. aureus viable cells by day 2 of co-culture (Figure 7). Inactivation of rhlI led to an initial 2.5 Log reduction of S. aureus followed by a recovery to levels found when in co-culture with other QS mutants (Figure 7). Overall, the relation of P. aeruginosa with S. aureus viability decrease was WT > ΔrhlI > ΔlasI = ΔlasIrhlI. 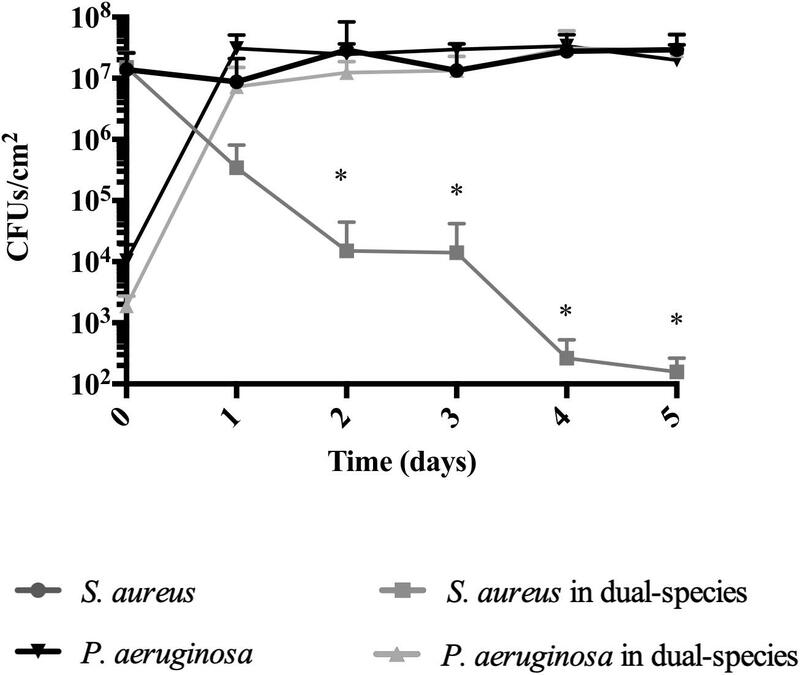 In contrast, the presence of S. aureus did not have an effect on P. aeruginosa WT (Supplementary Figure 1) but, resulted in a decreased of the cell number of all QS mutant in the first 3 days of co-culture (Supplementary Figure 1). Figure 6. 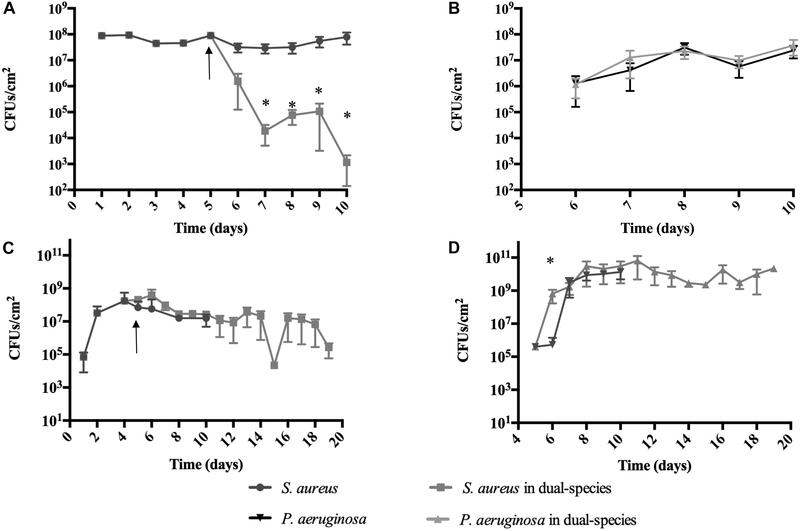 Effect of P. aeruginosa mutant supernatant on S. aureus growth. Supernatant of the PAO1 WT, ΔlasI, ΔlasIrhl, and Δrhll strains of P. aeruginosa were added to an agar plate containing a lawn of S. aureus. The lawns were allowed to grow for 24 h and zones of inhibition were measured using ImageJ. ∗p < 0.001 compared to media control. Figure 7. Effect of quorum sensing inactivation on the presence of S. aureus when in co-culture with P. aeruginosa. Biofilms of S. aureus were allowed to establish for a period of 5 days in microtiter plates after which, P. aeruginosa was introduced at a 1:250 ratio. P. aeruginosa strains consisted of PAO1 WT, ΔlasI, ΔlasIrhl, and Δrhll. Upon introduction of P. aeruginosa, viability of dual-species biofilms was quantified for further 5 days. Biofilms were cultured in 10% BHI at 37°C under static conditions. Media was exchanged every 12 h. ∗p < 0.001 all strains compared to S. aureus alone. Natural occurring biofilms are comprised of multiple species of bacteria coexisting in a single environment, however the interactions between the different bacterial species and the role of each species within these multi-species biofilms is mostly unknown. Thus, it is important to study these interactions in conditions that mimic in vivo conditions. In wounds, as well as in the lungs of CF patients, it is common to co-isolate S. aureus and P. aeruginosa, although it has been challenging to co-culture them in the laboratory. Our study focused on the ability of S. aureus to persist in dual-species biofilms when co-cultured with P. aeruginosa, both on abiotic surfaces and bronchial epithelial cells. Ordinarily, studies involving two or more bacterial species growing as biofilms initiate cultures where bacteria are inoculated simultaneously and at identical concentrations. Here we attempted to mimic in vivo situations, where S. aureus infections are established previous to P. aeruginosa. When using this approach, we found that in most cases, S. aureus was able to maintain a substantial concentration within the dual species biofilms, albeit with a decrease presence with the increase of time of coexistence with P. aeruginosa (Figures 1, 2). P. aeruginosa however, was not affected by the presence of S. aureus (Figures 1, 2). In all of the biofilm experiments involving tube reactors it was observed that viability of S. aureus within the dual-species biofilms fluctuated, showing a somewhat cyclical pattern (Figure 1). When S. aureus was allowed to reach the stage of a mature biofilm prior to the introduction of P. aeruginosa, it persisted within the dual species biofilm at a higher concentration compared to co-inoculation (Figure 2), suggesting that established biofilms of S. aureus have a greater resistance to removal by P. aeruginosa. Pseudomonas aeruginosa produces multiple virulence factors that contribute to the removal of S. aureus from dual species cultures, with the las and rhl system being the major regulators of these factors (Wu et al., 2001; Bjarnsholt et al., 2010a). In this study we quantified the relative expression of several P. aeruginosa QS genes during biofilm maturation when cultured alone and in co-culture with S. aureus. Overall, we found that when in dual-species the majority of P. aeruginosa QS genes were up-regulated within the initial 3 days decreasing from that point onward, compared to single species (Figure 3), similarly to when comparing to day 1 of co-culture (Figure 3). These findings suggest that an equilibrium is reached between the bacterial species allowing for co-existence. The effect of QS on the co-cultures was further confirmed by the decreased removal of S. aureus (Figure 6) when co-cultured with mutants lacking one or both major QS synthases (lasI, rhlI, and lasI/rhlI), confirming previous findings (Ciofu et al., 2010; Alavi et al., 2013). In addition, exposure of S. aureus to the supernatant of each of the P. aeruginosa mutants resulted in a decreased zone of inhibition compared to the wild type, with the lowest inhibition occurring in the absence of both synthases (Figure 5). When determining the relative gene expression of several of the major genes involved in S. aureus biofilm formation we found that they were mostly down-regulated compared to single species, with the exception of agrB (Figure 4), which is one of the major components of the agr auto inducing peptide signaling system in S. aureus (Recsei et al., 1986; Boles and Horswill, 2008). The increase in expression agrB coincided with the rebound of S. aureus viability found during the viable counts, and the stabilization of QS gene expression in P. aeruginosa (Figures 1A, 3, 4). These genes are commonly associated with virulence in S. aureus, and this increase in expression could suggest a phenotypic change leading to the increased presence of S. aureus on day 4 of dual-species culture (Goerke and Wolz, 2004). Overall, these data suggest that quorum sensing plays an essential role in the co-existence of these two bacterial species, and that our growth model enables the study and the achievement of further insight into their interactions throughout the biofilm development. The model used throughout this study demonstrates the ability of S. aureus to persist within a dual-species biofilm that contains both S. aureus and P. aeruginosa. Mimicking the patterns found within an actual infection enabled the co-culture of these two species and the further understanding of their interactions, during the dual-species biofilm development. Further studies using this model will allow for a better understanding of the interactions between S. aureus and P. aeruginosa and how they co-exist in the environment and contribute to infection and chronic diseases. CM conceived the concept. PW, ZH, and EM carried out the experiments. CM and PW co-wrote the paper. All authors discussed the results and comments on the manuscript. This work was funded by the Binghamton University structural funds, an undergraduate educational grant from the Howard Hughes Medical Institute to SUNY Binghamton, NSF grant 1139772, and the NIH educational grant 2 R25 GM056637-14. We would like to acknowledge Wilmer Cervantes and Vince Hopkins for the help in developing some of the methods. We would also like to acknowledge the support from Binghamton University structural funds, NIH educational grant 2 R25 GM056637-14, NSF grant 1139772 and the Howard Hughes Medical Institute educational grant to SUNY Binghamton. Cystic Fibrosis Foundation (2016). Patient Registry Annual Data Report 2015. Bethesda: Cystic Fibrosis Foundation. Copyright © 2019 Woods, Haynes, Mina and Marques. This is an open-access article distributed under the terms of the Creative Commons Attribution License (CC BY). The use, distribution or reproduction in other forums is permitted, provided the original author(s) and the copyright owner(s) are credited and that the original publication in this journal is cited, in accordance with accepted academic practice. No use, distribution or reproduction is permitted which does not comply with these terms.